So whether you are removing dead seed and weed seed in seed conditioning systems, removing foreign material and damaged nuts in nut processing systems or separating different density plastics in recycling, the Marc shines. Anywhere there is a need to remove less dense contaminants from a product, the Marc is the machine you need. The ripple deck design gives the deck covering more traction for the separation process. A more complete and distinct product separations is achieved. The automatic discharge system senses product depth and adjusts the discharge gate for fluctuations in product flow. This consistent bed depth eliminates constant readjustments. Multi-lights adjustable gates enable precise control when adjusting light product discharge. A greater bed depth than other gravity separators actually allows LMC’s Gravity Separator to use the product to make more precise separations. On the deck recirculation eliminates the need to have middle cuts. Middle cuts, with more handling, increase product damage. Gone are the blends seen on other gravity separators. The fluidized bed is created single a single super-quiet high efficiency fan. Three component deck system (Deck Cap, Insert, Diffusion Plate) allows for easy change between product changes and sanitation. Reliability and durability have a great impact on a facility’s bottom line. LMC’s Marc Gravity Separator are built with heavy duty frames and precise mechanical design features. Since the Marc is so well built, customers typically realize a decrease in repairs and downtime. Through expert research and development, the Gravity Separator has the ability to work with any dry, flowable product. 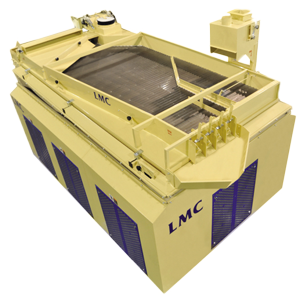 This flexibility along with the separator’s ease of operation has made made the LMC a leader in the separating industry and cleaning industry. The Marc is designed per food quality construction standards. The finishes and contact surfaces meet the rigid requirements for proper sanitation. Sanitary design is particularly important in today’s processing where our customers are continuously changing between food products. The Marc is self cleaning and the screens can be changed between food products. Our customers find the Marc Series bolsters their ability to produce cleaner and safer food products. LMC supplies not only the domestic U.S. market but as one of the largest exporters in south Georgia, we export gravity separators all over the world. Our equipment is currently operating on every continent with the exception of Antarctica. The counterbalanced Construction greatly reduces vibrations and extends machine life. The AC inverter controls with a digital RPM display on the eccentric and fan motors allow simple micro speed adjustments.